What should Item draw next? Keep waiting! Item and I were *far too busy* this evening to look at the 'what should Item draw next?' list, sad to say. 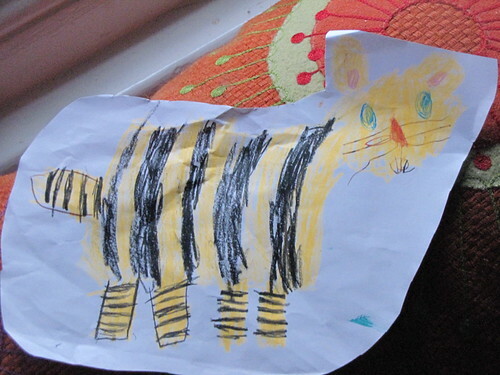 However, she did bring this excellent tiger home from school. Shame no-one said 'tiger' - ah, well. Weekend's coming up. I love her tigers. Check out that face. I guess they have scissors at school. No wonder she likes it so much.